Right, so somebody had the brilliant idea that we should run Mud Hero... A 6k obstacle course through the mud. Right. About that. 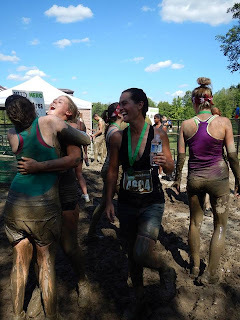 We started off with a big group - all sorts of interest several months *before* actually being required to run a 6k obstacle course through the mud. The day of, however, we were down to three officials and one sub in :) None of whom had actually trained in any way beyond blaring some Eye of the Tiger.... Although admittedly a rather effective method since somehow he managed the fastest time of the group -- maybe the rest of us should consider it next year?) Or maybe not. As for more traditional methodologies though. Yeah - not so much >;-P We can all ride, and muck the barn, but that's about it. 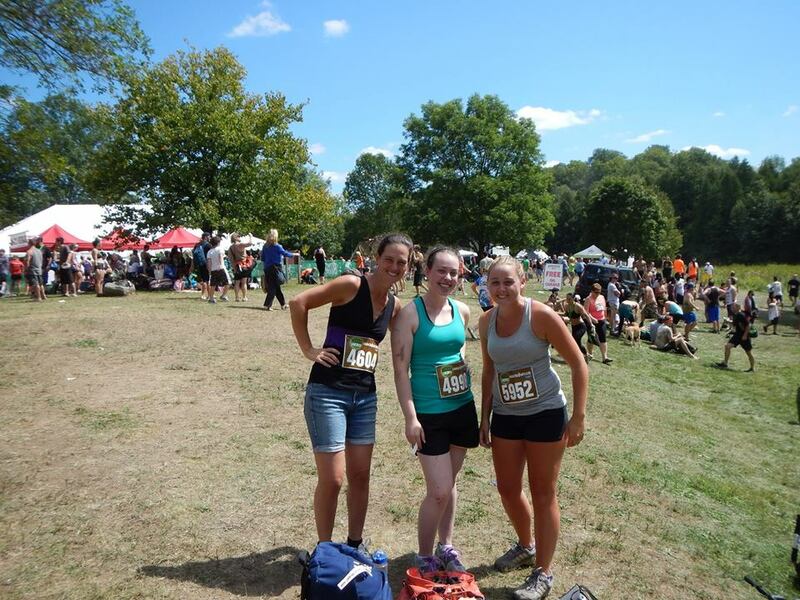 Three of the four of us were all kinds of environmentally friendly and carpooled together. S, however, having more of a social life than the rest of us and plans following our adventure, drove herself. I got a text: "I'm in parking lot G." ummmmm sure. Our parking lot had no letter. Why don't we just meet at registration? We meandered our way toward registration (wouldn't want to use up extra energy any earlier than necessary after all) and got ourselves signed in. I was fully expecting at least a little hassle about our last minute competitor switch, but nope - all good. Sweet. No sign of S yet, so we found ourselves a place on the hill to hang out. The corral, ummm race start, was off to the side and various booths and competing music blaring from all around. One random dude bouncing around on a bike -- he was actually reasonably impressive. Eventually I get a text that S has arrived, so found her pretty quickly. Apparently she'd parked a bit farther away than the rest of us. And soon enough, we were all ready to go. Somehow I look tall in this photo??? How did that happen? Dropped off our bags and made our way to the pen. Ummm start line. It was *really* loud at said start line and bringing out the inner-cheerleader in S. Yeah. That was fun. So while S was getting all cheery, K and C were being all competitive. Foolish, foolish people. And before we even get to our story... For the record -- the rest of this post might be a bit.... interpretive *g* I mostly remember what we did, but what order...? Meh :) It's a little bit of a you get what you pay for situation. Consider yourself forewarned. 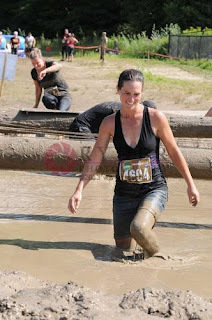 So it was quite a long walk to the first obstacle, which was really just a pit -- about thigh-deep mud just to wade through. Not a big deal, just introducing the concept. Then just some hiking through the woods - no mud involved actually, but had it been raining it might've been the most treacherous of them. As it was though, it was fairly simple. Next was a series of walls and ropes -- hop over the wall, climb under the rope. Rinse and repeat. Oh wait - nowhere to rinse. Ugh. Hopping the fence took less effort than getting on a horse, so that was a lot less challenging than it looked on first glance. Then there were cars to climb over -- really, what kid *hasn't* wanted to do that at some point? Actually - not sure it was ever an undying wish of mine, but hey it was still amusing. The windows were all boarded up so all good. We were then treated to a wonderful delicacy... A tiny glass of really warm water. Fabulous. Seriously :) S even had seconds! The rope wall came next -- I actually really enjoyed this one. Climb up, over, and back down. We weren't super fast but we made it with reasonably grace *g* The tunnels following however... Oh dear.... In a mud pit then up these tiny metal-looking tunnels. A whole lot less than fun as they were very slick with no traction and not big enough to crawl... I made it to the top and... No S? Ummm okay... So then I saw another competitor coming through and she was coming up backwards -- reasonably brilliant idea. Then I realized a couple of the tunnels had ropes in them -- all kinds of cheating! I don't know if my tunnel might've had one earlier in the day that had since disintegrated or if it had never had one in the first place. Regardless - still no S.
So I started looking *in* the tunnels... And there's S, sliding backwards, arms outstretched... Oh dear. hahaha so some teamwork got her through as I reached down to give her a hand up and we were good to go. And after this it all gets a little fuzzy... But I'm going with the next thing was the climbing wall -- like the other walls only taller and it had both footholds and ropes to help you scale. The down side had a platform and steps. Super easy. There was the spider web in the woods. Sounds horribly creepy but the only horrible part was the people in front of S and I. bahaha they made life all kinds of challenging. Really though, just a bunch of stretchy ropes strung between trees at all different levels to navigate between. Think the dollar-store version of the Entrapment training course. Then we got to do some more crawling under a canvas tarp type thing. This would probably have been challenging if we were taller or it was earlier in the day, but by the time we got there it was clay rather than mud and the tarp was high enough we could crawl easily. No bellying through that one. Thankfully. There was a nice walk through the woods and a surprisingly warm shower on the bridge. 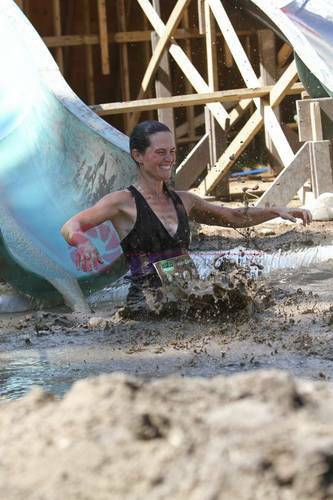 We figured out why we were allowed this luxury when the next obstacle was a slide. Yup, you read that right. Can a slide even be considered an obstacle? hahaha and it was all sorts of fun; slide down into a muddy-water pit. Would've been the most fun activity were it not for the guy who felt the need to cannonball in behind me *sigh* hahaha ah well. Not having *any* fun at all! No idea who gets credit for this but found it here. After the slide we had a balance-beam exercise that was about as simple as it got -- walk across the balance beam and try not to fall into the mud. hahaha simple really. We had the rope climb from before, but now sideways -- so either run across it or crab-crawl across it. Actually found that one reasonably entertaining. A nice walk through the woods and along the driveway led to another wall to climb and a fire-pole to slide down. Fairly speedy drop to the ground given how muddy it was. hahaha all good though. Almost home! The lake -- a nice wading path, clean off the mud, the world is good. Could feel some of the leg muscles toward the end of the wade, but still -- all good. And a giant inflatable slide (think bouncy castle), which, surprisingly, did *not* have a mud pit at the bottom! Sweet! All good right? Clean off right at the end? Yeah -- except it's Mud Hero. It wouldn't do to have people finishing clean. hahaha so yup, one last pit. With several low logs and some ropes to climb under. hahaha apparently strolling is not the competitive way to complete this course. But all were happy, muddy, and exhausted. 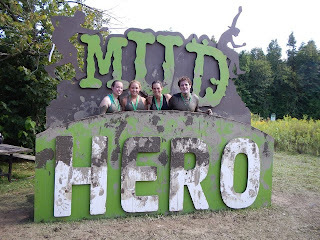 So yeah, overall, I'd say the obstacles were significantly easier than I was anticipating but you could make the course challenging if you were so inclined (S and I most definitely were not!) I'm not sure I'll set out to do it again, but I wouldn't avoid it either if a group of people wanted to go :) A very fun day. Writing.... Psyc novel first draft is long since done and totally on hold until such time as I choose to do something with it. Maybe never >;-P Second fantasy novel, however, is also complete and is at the editor's. I'm really quite excited about this one :) It'll be the first in a series. The second one is started, but paused as life got in the way. hahaha will be continued at some point though! And on that note - time to get back to work!